I will be live-tweeting the Mugno confirmation hearing on Twitter (@jbarab) that has just begun. If you don’t follow me on Twitter, now’s the time to correct that oversight. Also on tap is the nominee for head of the Bureau of Labor Statistics and a couple of Education Department nominees. For those of you who think you’re too good for Twitter, I’ve copied all of the tweets below, starting with the most recent. In other words, to read in order, start at the bottom. And the hearing wraps up after around 2-1/2 hours. This has been my first experience at live-tweeting, so please excuse typos, misspellings items I may have not heard accurately. Over next few days I will expand on these issues & correct any mistakes. Thanks for tuning in. Mugno responds to Hassan that he will push for more enforcement resources, along with resources for other OSHA programs. Then this: “And, if I recall, in the most current budget, OSHA enforcement did get an increase.” Wrong. Wrong. Wrong. No OSHA enforcement increase since 2010. Hassan asks Mugno if he thinks that OSHA should target most dangerous workplaces in most dangerous industries and will he push for more resources? Last question to Hassan who focuses on importance of strong and targeted enforcement, but points out that OSHA has 45% fewer inspectors than 1980 when workforce was half the size as now. It now would take 122 years to inspect every workplace in NH just once. Warren asks if he thinks that companies that receive federal contracts should be held to a higher standard, and should receive federal contracts if they have violated health & safety laws? Mugno commits to consult with career experts re. old criteria & agrees communication has an advantage in others knowing what’s happening. Warren: not asking about policy of others but YOUR policy. On press releases, Warren notes that last administration’s policy was to issue press releases for cases over $40,000, but OSHA has almost stopped issuing releases. In 1st 10 months, only 36. Will you commit to reinstating deterrence policy of issuing press releases for big cases? Noting that OSHA is seriously underfunded & would take 150 years to inspect each workplace once, Warren asks if criminal charges are a priority. Mugno agrees, if criteria are met & in consultation with DOJ. And he talked with Acosta who agrees. Elizabeth Warren (D-MA) goes after Mugno on criminal charges, press releases and DOL contracts with companies that have violated OSHA standards. She talks fast, so I’ll try to summarize. Collins announces that “sadly” there will be another round of questions. “Sadly” for whom? Maybe the nominees, but not sad for those who want to learn about what these nominees want to do in these important jobs. Mugno says he’ll be glad to look at whistleblower program & consult with the committee. Baldwin asks about prioritizing Mid-America Steel Drum investigation. Commits to look at all of those types of investigations. Baldwin points out that OSHA’s whistleblower protections are “woefully outdated” in comparison to more recent whistleblower statutes. Does Mugno commit to studying current gap in OSHA’s whistleblower protections & report back to committee? Baldwin frustrated & disappointed because she submitted materials prior to the hearing so that he could respond. Also, details of case would never have come to light w/o actions of whistleblower. Impression that hesitant to issue willful violations to protect workers and incentive employers to respect law. Mugno: Not familiar with that case. Would talk to career professionals to get the details, but don’t have the information now to respond. Baldwin: Company received 15 violations for chem & reactive hazards. Suggest that violations were willful, but OSHA did not cite willful because evidence was too old . Company only received $108,000 OSHA fine. Baldwin (D-WI) to Mugno: Concerned about Mid-America Steel Drum that has been cited for various chemical-related violations as described in news reports that she will submit for the record. Comment: Isakson continues with myth that cooperation with OSHA PREVENTS injuries & fatalities, but enforcement (confrontation?) after an incident is only reactive. Fact is that strong enforcement (before or after an incident) also has a strong preventive function. Isakson (R-GA): Don’t you give awards for safety? (Yes) Don’t most advances come when companies and OSHA work together, rather than after an accident? Mugno: true, but also useful to work with OSHA after an incident. Isakson: Isn’t it true that workers comp is a major cost? “yes.” Isn’t it true that your manager’s priority is safey. Mugno: Safety is top priority. OSHA enemy or friend? Mugno: Ally. Safety is team sport. OSHA has much to bring to the table. Back to regs vs. guidance (2): A few interpretations that Obama OSHA made were controversial and subject of OSHA hearings (See PSM retail exemption) and R’s insistent that interps must go thru notice & comments — which would take years. Defeat the purpose & employers would hate. Back to regs vs. guidance (1): OSHA regs & standards are relative short, and employers and labor often ask for guidance as to how to interpret confusing or outdated parts. OSHA does hundreds every year, mostly for employers. And employers are usually happy with those. Mugno clarifies: Safety is a “team sport.” Everyone has to have “skin in the game.” Workers have “medical events” in workplace that they bring in from outside, especially when you have a job that is physical in nature. Health and wellness programs will help. Collins asks Mugno about his statement that employer has to look harder at employee. Some have taken that out of contest implying that he was blaming activities outside of worksite. Clarify? Regarding franchises and joint employer (2): During Obama, R’s wrongly accused OSHA of issuing new Joint Employer policy due to a leaked list of questions that CSHO were to use to question franchisees (e.g. McDonalds) to see who had safety responsiblity: franchisee or corporate? Regarding franchises and joint employer (1). Multi-employer policy is mostly for construction with different employers on a site. Different from joint employer. OSHA has a long history of using joint employer policy to address problems of temporary employees. Comment on Mugno and VPP: Mugno refuses to commit to expanding VPP. Probably because he realizes that OSHA doesn’t have the money to expand. Also says VPP and other OSHA programs shouldn’t be a zero-sum game. But, of course, with OSHA’s limited budget, they are. Mugno on VPP: VPP is “excellent way to expand OSHA’s mission.” Alexander wants to know if expanding VPP will be a priority. Say’s he’ll consult with Acosta and staff about that. Alexander asking Mugno about legislation to expand VPP to get OSHA out of the game of “gotcha” to focus more on cooperation with most worksites and let OSHA focus on worst employers. This guidance vs. rulemaking was a constant criticism of OSHA asking whether “guidance” is “binding.” All nominees say not binding. Including Mugno. Alexander begins questioning with Education Department nominees. Focusing on the role of “guidance” vs. “rulemaking” a pet peeve of Republicans who think that every interpretation of a regulation should go through full notice and comment rulemaking. Mugno also notes that he filed health and safety grievances while a union rep at Macy’s. Maybe he can talk to Labor Secretary Acosta about his unbelievable nomination of Ronald Reagan to the Labor Hall of Honor. Mugno notes that resources are limited. Looking forward to working with all of you, abiding by OSHA’s mission and laws. One would hope. Fully repects role that organized labor has played in OSHA history. Worked before with Pilot's union on a variety of issues, including infectious disease. This type of cooperation is vital to making workplaces safe. Also belonged to a union local at Macy's in his early years. Mugno calls OSHA staff the nation's best safety professionals. Not exactly what Trump is saying about the FBI. Why is he interested: To serve his country again (after the military). To give back to his country…. Also, no higher calling in the safety profession than this one and to fulfill OSHA's mission to provide safety and healthful working conditions. 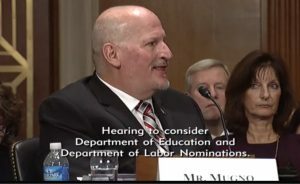 And Mugno gives his testimony: "Honored to be Donald J. Trump's nominee." Words you don't hear much these days and may come back to haunt. Aww. Even his mother is at the hearing. And extended family. That's sweet. Really. Murray moves on to Mugno: Accuses him of undermining new safety rules and enforcement ability while working with the Chamber of Commerce. Also safety record of FedEx, including recent deaths. Ranking member Patty Murray is up, criticizing Trump's rollback of overtim pay, Fair Pay and Safe Workplace regs and weakening health and safety protections, allowing companies to put employees lives and livelihood at risk to improve their profits. Chairman Alexander introducing nominee for head of BLS. BLS had come under attack by Trump during the election campaign when he public criticized rosy employment numbers as tainted by politics. Alexander emphasizes that BLS is supposed to be non-partisan. Chairman Alexander is introducing Mugno, relating a story of how Alexander’s father was safety director at an Alcoa smelting plant instilling in him the importance of workplace safety. Who knew? Previous Post Previous post: Worker Dies. Excuses Made.